The Waimakariri sub-regional planning process has been lengthened to reach an agreed understanding on the nature of groundwater movements under the Waimakariri River. his means that the Zone Implementation Programme Addendum – the recommendations prepared by the zone committee will be completed by September 2018, instead of December 2017. The coloured areas in the map below represent different nutrient management rules. For more information on each colour click on the expanding items below the map. Waimakariri Zone map. Click to download pdf version. If you are farming in a red nutrient allocation zone, you are not allowed to increase the nitrogen loss from the property above your nitrogen baseline calculated with Overseer. You are required to have a nitrogen baseline calculated for the property. If your nitrogen loss is 20kg N/ha/year or greater, from the 1 January 2017 you are required to have a farming activity resource consent, nitrogen loss calculation and a farm environment plan. If your property is part of an irrigation scheme with a discharge consent for nutrient losses, you may not require an individual farming activity resource consent. Check with your irrigation scheme. If you are within the Selwyn Te Waihora catchment you need to refer to the Selwyn Te Waihora Plan Change (PC1) rules. 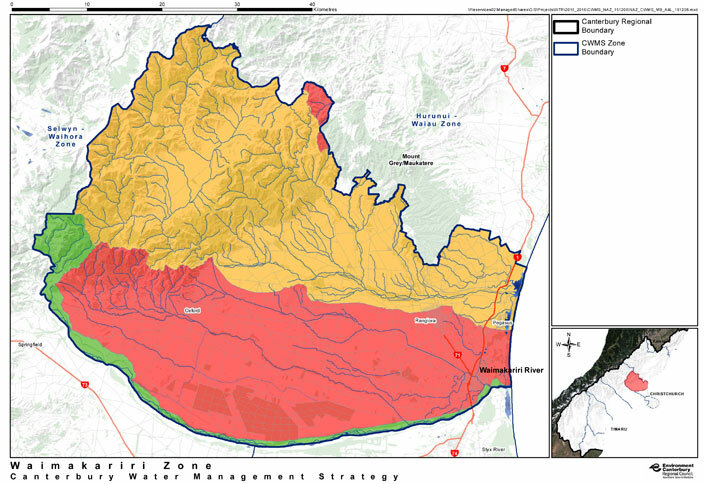 If you are within the Kaikoura, Waimakariri or Christchurch/West Melton catchments, refer to the Land and water Regional Plan rules. If you are within the Hurunui Waiau Zone catchment you need to refer to the Hurunui Waiau River Regional plan. The table below is a guide to the rules based on your farm size and nitrogen loss rates. In this zone any increase above the nitrogen baseline is a prohibited activity. Unless already consented, no individual property can increase average nitrogen loss above their nitrogen baseline (what the property was losing from 2009-2013). There is an option for groups of properties to work together to average nitrogen loss across multiple properties. These are called Farming Enterprises (a group of properties managed together). This will require all properties to operate under one farming enterprise resource consent. Ensure your ownership model or legal structure of any enterprise group understand the responsibility and potential liability that may be associated to this consenting option. Contact Environment Canterbury if you require more information on Farming Enterprises. For more information visit the Ecan Land & Water Regional Plan page. The documents below contain editable consent forms, planning assessments and examples to help guide you through the consent process for this zone. Below are some key documents that will help you through the process. Why do I get different Overseer Numbers and why are they important? If you are farming in an orange nutrient allocation zone, you are not allowed to increase the nitrogen loss from the property more than 5kg N/ha above your nitrogen baseline calculated with Overseer. (This is an absolute total increase of 5kg N/ha loss from your nitrogen baseline loss NOT a compounding increase of 5kg N/ha/year each year above your nitrogen baseline). Any increase above this will require a farming activity resource consent. If your nitrogen loss exceeds 20kg N/ha/year and your farm is larger than 50 hectares, From 1 January 2016 you are required to have a farming activity resource consent, nitrogen loss calculation and a farm environment plan. If you are within the Kaikoura catchment you need to refer to the Land and Water Regional Plan rules. Any increase greater than 5kg N/ha above nitrogen baseline is a discretionary activity. If you are farming in a green or light blue nutrient allocation zone you are allowed to increase the nitrogen loss from the property by up to 5 kg N/ha/ above your nitrogen baseline calculated with Overseer. (This is an absolute total increase of 5 kg N/ha/year loss from your nitrogen baseline loss NOT a compounding increase of 5 kg N/ha/year each year above your nitrogen baseline). Any increase above this will require a farming activity resource consent. Note: If your property is part of an irrigation scheme with a discharge consent for nutrient losses, you may not require an individual farming activity resource consent. Check with your irrigation scheme. The table below is a guide to the rules based on your farm size and nitrogen loss. Any increase greater than 5 Kg N/Ha above N baseline is a restricted discretionary activity. These are required for all farmers in these zones now. NOTE: If you are within the Selwyn Te Waihora catchment you need to refer to the Selwyn Te Waihora Plan Change (PC1) rules. For more information on Waimakariri or to obtain a copy of your Sustainable Milk Plan please contact Katherine McCusker on katherine.mccusker@dairynz.co.nz or 022 071 0255. Under the Canterbury Land & Water Regional Plan (LWRP), farmers must operate at Good Management Practice (GMP). A Sustainable Milk Plan is a free farm environment plan, personalised to your farm, which helps you focus on environmentally sustainable farming practices.